Coonstripe shrimp distribution is patchy but extends throughout coastal waters of the North Pacific Ocean from Korea to Puget Sound in depths of 5–460 m.
Coonstripe shrimp are a medium to large sized shrimp, and like other pandalid shrimp their long, spiny rostrum protrudes forward from their eyes and carapace. They are the second largest shrimp in Alaskan waters, typically ranging between 4 and 6 inches in total length, but up to 7 ½ inches. The distinctive darker striped markings on their abdomens help to identify them from other similar sized shrimp such as the spot shrimp (also called spot prawns), that have several larger and distinctive white spots, or the sidestripe shrimp which have white colored bands down the length of its sides. One additional distinguishing feature is that their carapace has a heavier or more robust appearance and is arched more than other Alaska shrimp. Four other pandalid shrimp species of various commercial and subsistence values are found in coastal waters of Alaska. Northern pink shrimp (Pandalus eous) were the foundation of the commercial trawl shrimp fishery in Alaska. Northern pinks are circumpolar in distribution, though greatest concentrations occur in the Gulf of Alaska. Ranging from Puget Sound to the Arctic coast of Alaska, the humpy shrimp (P. goniurus) is usually harvested incidentally to northern pink shrimp. In some cases, however, the humpy constitutes the primary species caught. 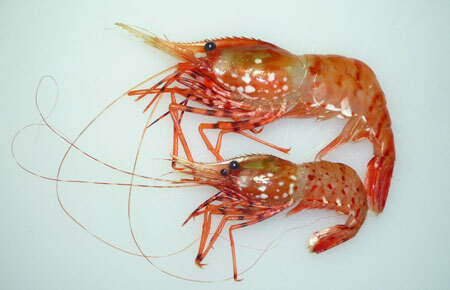 Both northern pink and humpy shrimp are usually marketed as cocktail or salad shrimp. Known for its sweet flavor, the sidestripe shrimp (Pandalopsis dispar) is also caught incidentally to northern pinks; however, there are small trawl fisheries in Prince William Sound and Southeast Alaska which target this deeper water species. Sidestripes range from the Bering Sea to Oregon. Spot shrimp (P. platyceros) is the largest shrimp in the North Pacific. Ranging from Unalaska Island to San Diego, this species is highly valued by commercial and recreational users. Coonstripe and other pandalid shrimps begin their lives as planktonic, free-swimming larvae. They periodically outgrow their exoskeleton, and shed or molt a number of times allowing them to grow into bigger exoskeletons. After the last larval molt, the shrimp becomes a juvenile when it settles to begin living at or near the bottom. Coonstripe and other pandalid shrimp are among the relatively few animals where most individuals spends their early life as a male and later transform into a female for the rest of their lifetime. Animals that go through this pattern of gender change are called protandric hermaphrodites. For example, coonstripe shrimp will typically mature sexually and spawn for the first time as a male at about 1 ½ years of age. These males later transition through a series of molts, into females at about 2 years of age, and the transition to all females are completed by 2 ½ years of age. A small portion of coonstripe shrimp start their lives as, and remain, females. Prior to fertilization, the female’s eggs have developed and can initially be seen inside the carapace. The female goes through another molt resulting in a shell specialized for carrying or bearing eggs with an expanded brood chamber, and in it, long hairlike setae which will hold the fertilized and developing eggs. During mating the male and female grasp while the male deposits a packet of sperm, called a spermatophore, on the underside of the female. Soon afterwards, eggs are extruded, fertilized by the sperm, and then attach to setae in the brood chamber. Female coonstripes carry between a few hundred and 4,000 developing eggs throughout winter and into spring when the female hatches her eggs. Although a few of these female shrimp may live to 4 years of age and spawn a second time, most die earlier. Like other large pandalid shrimp, coonstripe shrimp larvae drift freely with tides and currents and feed on plankton for a period after hatching. After they grow larger, they settle to the bottom as juveniles where they spend the remainder of their life. As omnivores, they eat a variety of foods collected by scavenging from dead animal and plant material or by preying on other small shrimp, amphipods, polychaete worms, and small crustaceans. At younger ages they are known to feed nearer the shore in shallower areas, but as they grow and mature they tend to move offshore into deeper areas. Coonstripe shrimp are prey for a variety of groundfish species. After hatching, larvae are passively moved by tides and currents before they settle to the bottom. Significant migrations are not known to occur with settled juvenile or adult shrimp. Coonstripe shrimp are found in northern coastal Pacific rim waters from the Bering Sea to the Strait of Juan de Fuca, in the East, as well as between the Sea of Okhotsk to as far south as the Korea Strait, in the West. These shrimp are known to inhabit smooth mud and sand bottoms but can also be found on harder bottoms, commonly at depths from 30 to 300 feet. In Southeast Alaska most coonstripe shrimp are harvested seaward of glacial estuaries including Bradfield Canal, Port Snettisham, upper Lynn Canal, Lituya Bay, and Yakutat Bay. In Southcentral Alaska they are known to occur in Lower Cook Inlet, particularly in the Kachemak Bay area and in Prince William Sound. In Southwest Alaska they also are found in Kodiak waters, but incidental catches also have occurred along the Alaska Peninsula. Some occurrence is also indicated by trawl surveys catches in Northwest Alaska, particularly in the Norton Sound area. In Southwest Alaska they also are found in Kodiak waters. Little is known of the status of coonstripe shrimp in Alaska as there are no stock assessment surveys for this species. Although it is generally considered stable, there are populations in Cook Inlet, Kodiak, and Southeast Alaska with low stock abundance. Population studies are not conducted on a statewide basis, and as such, trends on statewide abundance are not known. However, commercial, subsistence, and recreational fisheries do take coonstripe shrimp using shrimp pots and/or trawls around the state. Catch rates and harvest of coonstripe shrimp are monitored through harvest reporting and fishery management surveys in various fishing districts within the state. Many small Southeast Alaskan stocks have experienced declines in commercial harvest levels and some have had their commercial and recreational fisheries closed. Likewise, directed commercial and recreational fisheries on coonstripe shrimp in Lower Cook Inlet have remained closed since 1985 following continued indications of localized stock declines. In these locations, periodic stock monitoring efforts examine for signs of stock rebuilding and eventual reopening to harvest. In Kodiak, trawl fisheries which took coonstripe shrimp in lesser quantities have also been closed since the mid 1980’s and continued stock monitoring indicate the coonstripe shrimp along with other species’ populations remain at depressed levels. Many pandalid shrimp stocks in the North Pacific have experienced population declines thought to be associated with shifts in oceanographic conditions brought on by the Pacific Decadal Oscillation. This was particularly true for Pandalus eous in Kodiak, Cook Inlet, and Prince William Sound. These declines have been attributed in part to increased predation following the onshore movements of additional groundfish predators, such as Pacific cod, associated with warming bottom waters. The other major threat to shrimp populations is human exploitation. Because coonstripe shrimp stocks are generally small in size, they may be more vulnerable to overexploitation than their more abundant cousin, the spot shrimp, Pandalus platyceros. Although some individual shrimp are affected by parasites, impact to shrimp populations by disease is unknown. 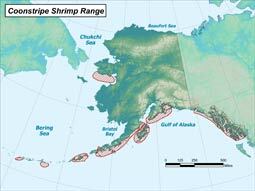 Alaska Department of Fish and Game manages shrimp stocks in all coastal waters out to 200 miles offshore.